I don’t know what I expected when I volunteered to lead the discussion on chapter nine of our BibleDude group blogging project, but it wasn’t a discussion on religious freedom. With a title like Making Space For Everyone, I was thinking tolerance; I was thinking love (I like to talk about those things). Bob Roberts, Jr. was thinking these concepts too, just from a slightly different angle. I was thinking of accepting differences inside the church–or at least showing love to people with differences. Roberts had a bigger picture in mind. Well, duh. The title of the book we are reading is Real-Time Connections: Linking Your Job with God’s Global Work. So small-minded me gets a lesson in Big Picture thinking, and I’m all the better for it. …a failure to understand who believes what and why it matters–continues to cause confusion and prevents leaders from truly understanding the problems and underlying causes of conflict. Our chapter starts with a history lesson. 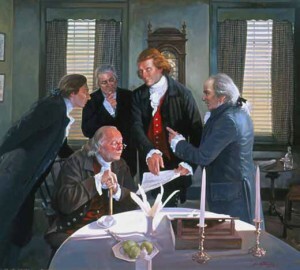 Roberts gives us a rundown on how religious views shaped the foundation of our country. America’s roots in religious freedom started when a Puritan named Roger Williams was banished from Plymouth Colony in 1635. Williams was not only the first proponent of separation of church and state, he believed in something he called soul liberty–which he defined as the right of each individual to follow his own conscience in matters of faith. Williams founded the colony of Rhode Island in 1638 and established the Baptist Church in that year. Religion is essential to the flourishing of a republic. To thrive, religion needs less help, not more, from the state. God gave all humans the right to full religious freedom. The founding faith, then, Waldman concludes, was not Christianity, and it was not secularism. It was religious liberty–a revolutionary formula for promoting faith by leaving it alone. But why should I care about religious freedom? Shouldn’t I be concerned only with the freedom to practice my own religion? Shouldn’t I be grateful when practicing other faiths is prohibited by law? I mean, after all, they are wrong, aren’t they? Such thinking of short-sighted, according to Bob Roberts, Jr. Religious freedom is important, says he, because it ensures that Christianity will never be prohibited–despite a growing intolerance for it. In protecting the right of others to practice different faiths, we are also protecting Christianity. Restricting religious freedom also inhibits the impact faith has as cultural unifier, says Roberts. At the heart of the concept of religious freedom is the recognition that the human being has a conscience, and they must have the freedom to follow where their conscience leads, even if it leads them in a wrong direction. Without that freedom, faith is forced and becomes a societal obligation imposed on everyone. When this happens, true faith loses its power and no longer has the ability to engage individuals at a meaningful level or to produce the personal transformations that will, in turn, transform the culture. Faith matters in society for many reasons. Some of the reasons Roberts points out are: faith is necessary to form the character of society, faith is necessary for the spirituality of society, faith is necessary for the conscience of a society, and convictions become the basis of all behaviors. …religious freedom promotes stability, helps to consolidate democracy, and lessens religious violence. Based on our analysis, it is much more than an American pet peeve; religious freedom is a universal aspiration. Why Does Freedom of Religion Matter In Society? Freedom of religion allows healthy expression for diversity. Under religious freedom, conscience cannot be bullied or bought. Freedom of religion keeps evangelism pure. Freedom of religion allows investigation of alternatives. If Christianity cannot win because of its message, winning by the sword will be futile. What we would force, we cannot hold forever. What we believe and accept willingly in our hearts will last beyond our life on earth. Christianity should be accepted on its merits, and its love demonstrated in the activity of Christians…the right of a person to choose, even wrongly, is important because in the long run, it benefits Christianity…that shows me people are granted the right to choose, and when that right is granted, the message of Jesus has a chance to prove itself. The question is, do I believe Jesus is powerful enough to make His voice heard amidst the din of other faith voices out there? Of course I do. He certainly has a better chance of getting the Good News heard than I. This chapter has helped open my eyes to the smallness of my world. Here in America, we live a privileged and sheltered life. Reading the stories about the Christians in Vietnam that Roberts shared was deeply moving, but also shattering for me. I have to ask myself, what am I doing to help these brothers and sisters who struggle so tangibly to worship in their Christian faith? It is a question that makes me uncomfortable. Embracing religious freedom requires a higher love…a higher tolerance than I have ever considered. And faith too. I have to trust God to change hearts in amazing ways. I am so grateful that He can. How are you using your religious freedom to bring about transformation? Whom do you know who has been persecuted by being beaten, put in jail, or killed simply for being a Christian? Pretend God is calling you to work in a place where there is no religious freedom–what would you do?